On Good Friday in 1869 Edward Morris, the Manager of the Newfoundland Savings Bank went out for his daily constitutional, a walk about the town of St. John’s. He interrupted his walk, deciding to drop in on his friend Robert Kent. Upon arriving at the house, he discovered that his friend was out but his father (Jimmy) was at home, in a heated argument with the servant of the house. In his diary Edward Morris explained. “I found (Jimmy) disputing with the servant about a bun which she was giving him as a cross bun, he seemed very dubious, as indeed he might, for it was one of the old familiar type of common penny buns”. This was not a small matter in 1869. 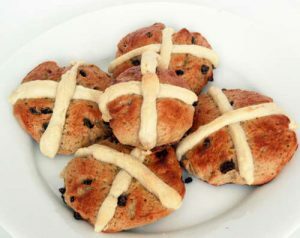 Good Friday was a day of fast, but one of the treats, on this day, was what we now call a hot cross bun. Jimmy Kent was not to be deprived of his “cross bun” for the inferior “penny bun’. Lash’s on Water Street, St. John’s had a reputation for making the very best Hot Cross Buns. All of the St. John’s shops would sell Good Friday or Hot Cross Buns. Competition between the many bakeries and shops in St. John’s to capture the Good Friday customers was fierce. Advertising typically started in the St. John’s newspapers on ‘Spy Wednesday’ and more on ‘Holy Thursday’ encouraging the purchase of the Hot Cross Buns. You could easily place an advance order but they had to be picked up on Holy Thursday. All the shops were closed on Good Friday. In Newfoundland, the Hot Cross Bun is the most famous, and probably the oldest, of the many English buns. The Hot Cross Bun was originally eaten only on Good Friday. According to tradition, Father Rocliff, a monk and the cook of St. Alban’s Abbey, in Hertfordshire, on Good Friday in 1361 gave to each poor person who came to the abbey one of ‘these spiced buns marked with the sign of the cross’, along with the usual bowl of soup. The custom was continued and soon spread throughout the country. Hot Cross Buns became enormously popular in England in the eighteenth and nineteenth centuries. Because of the cross on the buns, some say they should be kissed before being eaten. Definition: What is Spy Wednesday? Wednesday (April 17 ) is known as Spy Wednesday because on this day in Christian scripture, Judas one of the disciples made a bargain with the high priest to betray his friend Jesus for 30 silver pieces. (Matt 26:14-16; Mark 14:10-11; Luke 22:1-6). This entry was posted in Archival Moments and tagged Assize of Bread Act, cross bun, fish, Good Friday, Hot cross buns, Lash's Cross Buns, penny buns, Seal on April 16, 2019 by Larry Dohey.